Eleanor J. Bader: The title of your most recent dance, “Everything You Have is Yours?” comes from a question you were asked by an Israeli Security officer. Hadar Ahuvia: There are layers of meaning and symbols in every movement that connect me to my Israeliness. 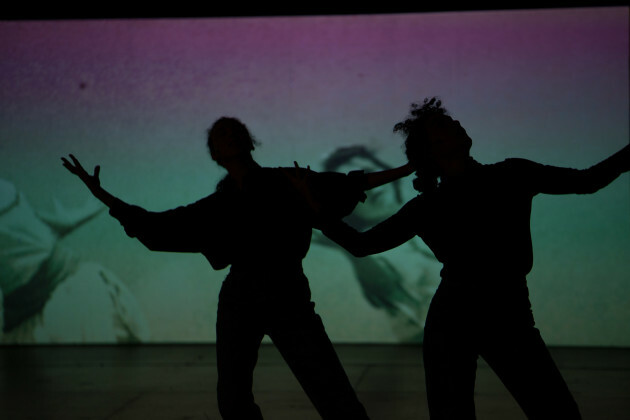 “Everything You Have is Yours?” looks at how Israeli folk dances are embedded in the Zionist project, the desire to create a new, native Israeli body of art, and addresses the tokenization of indigenous people and their dances. EJB: Tell me about the process of choreographing the piece. HA: My choreography process is dialogic, sometimes moving with music and sometimes moving without. When I first started working with Israeli Folk Dances, I did them for myself and wondered how it would be to move through them with the anger and pain I felt in my separation from Zionism. I did the dances without music. I screamed the songs. I tried to move incessantly and improvised, building on the folk dance steps I knew. I wanted to give context for the dances so I deepened my research, studying the construction of the dances and the steps that comprised them. I used many sources—Palestinian and Israeli — and asked questions of artists, activists and scholars. I then played with the ways I could simultaneously perform and explain how the dances were made. I looked for ways to expose the choreographic process. I do this by imitating appropriated movement materials from videos, using texts written by Israeli folk dance choreographers, and then lecturing as I perform. Eventually with my collaborators — Mor Mendel, Gil Sperling, and lily bo — I’ve been able to expose the racism in my own choreographic desires. EJB: You talk about the pain of separation from Zionism. When did you begin to see Israel as an occupying presence? HA: I was born in Argentina and lived in Israel from the age of five until I was 10. My family moved a lot because of my father’s job. But no matter where we lived, Zionism was always our defining identity. Two of my grandparents were born in Israel and the others came in the 1920s and 30s; all were active in the Labor Zionist movement. My mom used to say that my grandfather wasn’t religious, he was Zionist. It took me a while to realize that this meant that the state was his—and by extension our—God. When I was growing up, my parents were supporters of the Labor Party and I grew up hearing that ‘not all Arabs are bad, but…the conflict is their fault.’ There was almost no awareness of displacement. And if it was mentioned, it was said in a way that implied that the dislocation was the fault of the Palestinian’s themselves. My family lived in Hawaii when I was in my sophomore and junior years of high school and I began to see how the state’s indigenous population had been suppressed but remained alive and on their land. At the same time as I was becoming aware of this, one of my teachers gave me a book written by Edward Said to help with an independent project I was doing for a philosophy class. I remember one moment vividly. I asked my mom if she knew about conditions in Gaza. She responded by saying, ‘Oh Hadar, you sound like a Palestinian,’ as though the word Palestinian was something dirty. I quickly realized that this was not a topic I could talk about with my parents. But Said’s ideas stayed with me and the stories he told about people’s lives resonated. I started reading more about the expulsion and found many stories that had been hidden, suppressed, dismissed and obfuscated in my upbringing. During my senior year of high school, I moved to San Francisco—alone, without my family—to study with LINES Ballet. While there, I went to a lot of film screenings and panels about the Israeli-Palestinian conflict. This was in 2004; I was incredibly moved by the footage of Palestinians fleeing that I was viewing for the first time. EJB: How did this impact you overall? HA: I felt ashamed and distanced myself from Jewish and Israeli life for the next four years. Then, a World Dance class taught by Rose Anne Thom at Sarah Lawrence College led me back. After I graduated college in 2010, I moved to Brooklyn. Once there, I found a progressive Jewish community and became involved with a shul called Kolot Chayenu. I’ve worked there since 2011 as a teacher and spent three years as the assistant director of youth education programs. I now tutor Bar and Bat Mitzvah students. Kolot Chayenu helped me develop an anti-colonial, anti-occupation, diasporic perspective, and the more I studied, the better I understood my own earlier denial of Israeli history and the role of the US in maintaining Israel as an occupying force. EJB: How have you linked your political perspective to your interest in dance and performance? HA: I started learning about Israeli folk dance history from the perspective of Palestinian Dabke dancers. Dabke is a dance performed across the Levant that has been codified by Palestinians. It’s now a form of cultural resistance for them. I also read books from the perspective of Israeli choreographers including Rivke Sturman, one of the founders of the Israeli folk dance movement. It was really clear to me in reading Sturman’s journals that she exoticized and romanticized the Arab dances that she saw. It was also really clear that she didn’t see these dancers as possible members of her community. We’re still dealing with these issues today in contemporary choreography. EJB: You created a dance called “Joy Vey.” Can you describe it? HA: Part of my process involved coming out of the shame I felt about my Israeli identity. Still, the question remained: How do I bring my political awareness to dance? What developed is something in which I emote my anger. I’ve rewritten some of the lyrics to turn a song about love of the land into a Kaddish for both depopulated towns in Palestine and depopulated Jewish sites in Europe, North Africa and the Middle East. This is not to suggest that the losses are equivalent, but to see that a string of traumas have impacted various Jewish and Palestinian communities. I sing live during this piece and there is also a recording in which I spell out, in ways that are clear to me–and I hope equally clear to the audience–that I’m turning the dance to face what Palestinians call the Nakba. On one hand, the dance is talking about displacement. On the other, it’s acknowledging my own connection to Israel. EJB: Do you plan to continue performing your most recent dance, “Everything You Have is Yours?” How about other choreography projects and your ongoing activist work? HA: I’m working on a thematically-related new show that will premiere in May. Right now, I’m riding a line between contemporary dance and activist work. I’ve gotten a lot of support and quite a few residencies, including an organizing fellowship from Jews for Racial and Economic Justice. “Everything you have is yours?”excerpt from Hadar Ahuvia on Vimeo.